The West Coast Saints began 2019 as they finished 2018 with a grinding victory in heavy conditions against the Burnaby Eagles. The Eagles were competitive early but the polish and cleaner ball use by the Saints saw them take a 2 goal lead into the the first break. From there the Saints controlled the play for the rest of the afternoon, slowly building their lead before running away with it in the last term. In the end they ran out 43 point victors and look on track to be the team to beat again in 2019. In the second game, the Vancouver Cougars were too strong for an undermanned Seattle Grizzlies outfit. After an even first term the Cougars took control in the second and third stanzas and the game was out of reach for the Grizzlies by 3 quarter time. 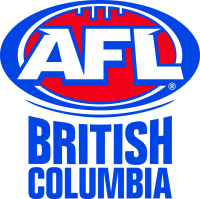 The Grizzlies fought it out in the last term and outscored the Cougars for the quarter in what was an encouraging sign for them when they will be back to full strength on their home deck in round 2. The Cougars were well organised as always and look like they will be right in it at the pointy end of the season again. In the third match the Vixens had an intra-club match as their first hitout for the season. They have had a very productive off season with recruiting and working with the graduates from the West Coast Wilcats. In a spirited contest the the White team came back from a 15 point quarter time defecit, drawing within a point at 3 quarter time but the black team were able to hold them off in the last quarter to take out a 3 point victory. Overall it was a tough day for footy with strong (cold) winds and rain for most of the day but the football was of a very high standard in spirit and in skill. Round 2 is on April 27, the Grizzlies will host the Eagles in Seattle and the Vancouver-Whistler Hawks will kick off their 2019 campaign at Burnaby Lakes Field trying to get some revenge on the Saints who beat them in the 2018 Grand Final.